A conjunction is a joiner. At times there are two sentences that go together, but they have to written separately. If only there was a way to combine a sentence together, so that it would be easier. Take for example, “Maria went to the store. She got a shirt. She also got a pair of pants.” Writing it out makes its sound awkward and unnecessarily long. This is where a conjunction might come in handy. So, instead of the about sentence, we would say, “Maria went to the store, and she got a shirt and a pair of pants.” So, instead of the above three awkward sentences, we have one shorter sentence that gives us all the information together. This is the function of a conjunction. A conjunction is a joiner. It is a word that is used to connect parts of a sentence. It can connect phrases or clauses together to form a complex sentence, or connect sentences together into one. 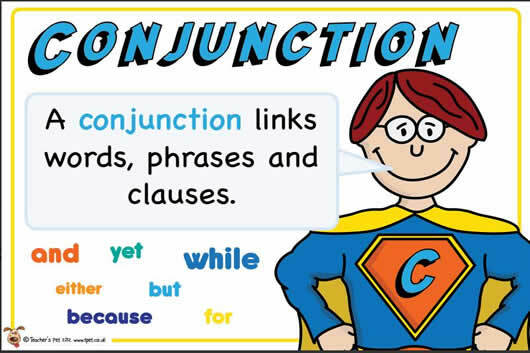 Coordinating Conjunctions: and, but, or, nor, for, yet, so, etc. Subordinating Conjunctions: after, although, as, before, even, if, just as, now, who, when, etc. Correlative Conjunctions: both/and, not only/but also, either/or, neither/nor, whether/or, as/as, such/that, scarcely/when, as many/as, no sooner/than, rather/than, etc. The bottle nor the glass. Go, but come back soon. I have to go, so do you. I closed the door, after which I realized I left the keys inside. Before you leave, can I ask something? Not only did I get the ring, but I got the necklace as well.